I hope you’re ready for a life of adventure! If not, please don’t buy this book. Put it down and walk away. There are some other nice books on that table over there. 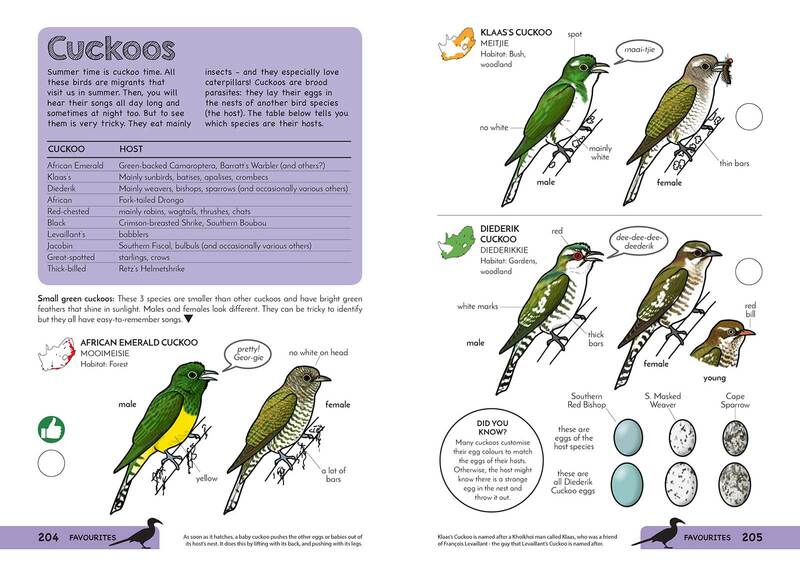 But if you are, this book will help you to identify every single bird in South Africa. Easily! 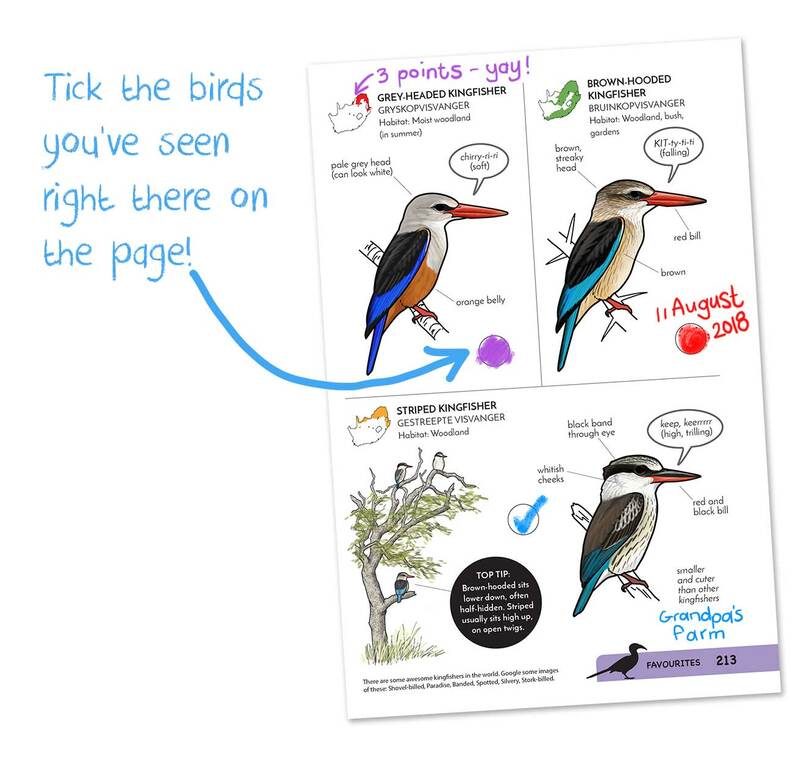 Along the way you will learn fun and funny facts about everything from space to superheroes, with some bird stuff too. 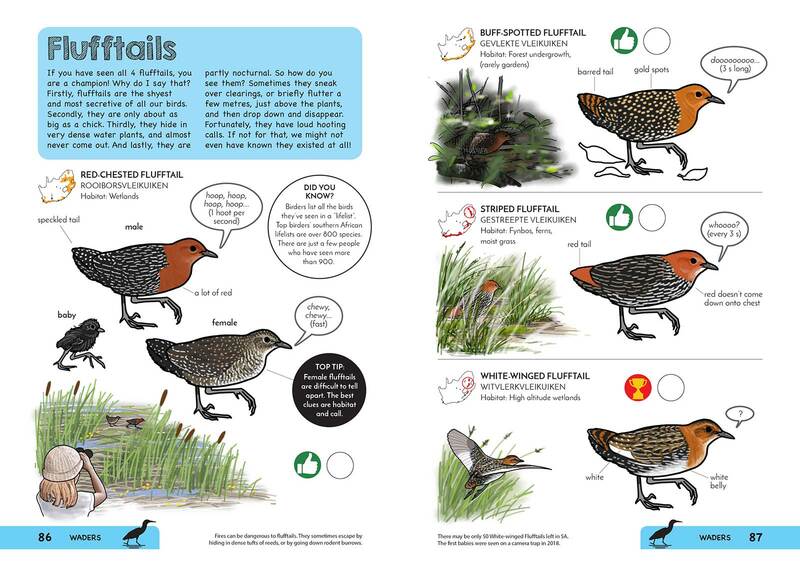 The first ever full field guide made just for kids. A radical new approach, with minimal text and maximum fun. 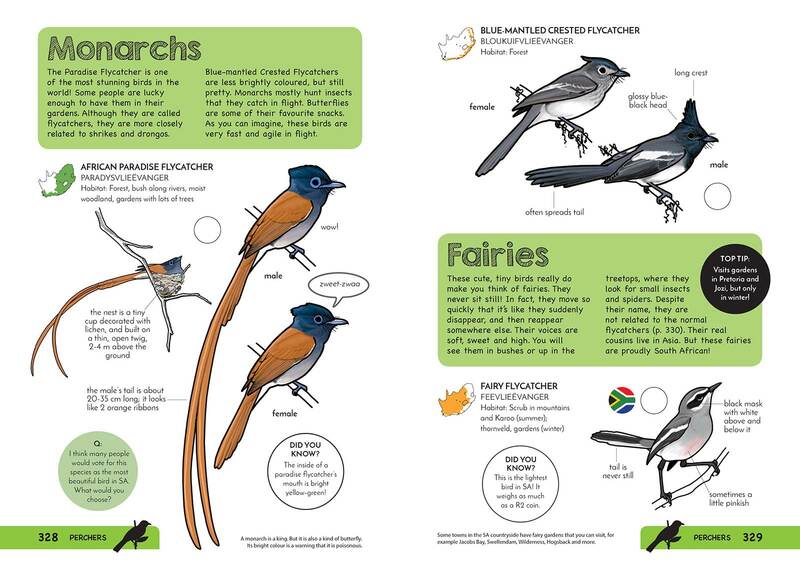 Faansie’s Bird Book covers every single bird that occurs regularly in South Africa (722 in all!). But it doesn’t get caught up with complex and boring technical stuff. Everything is as simple and fun as it can be. 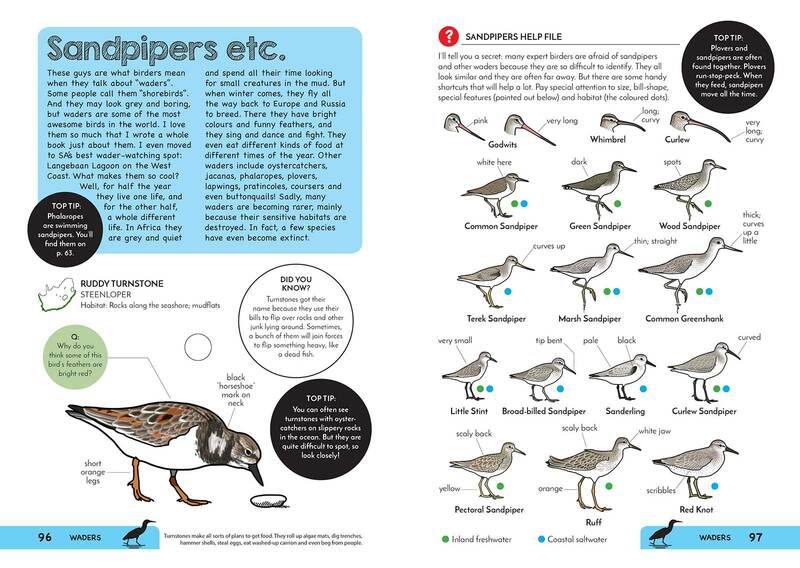 It’s a whole new way of birding – kids, you’re gonna loooooove it! 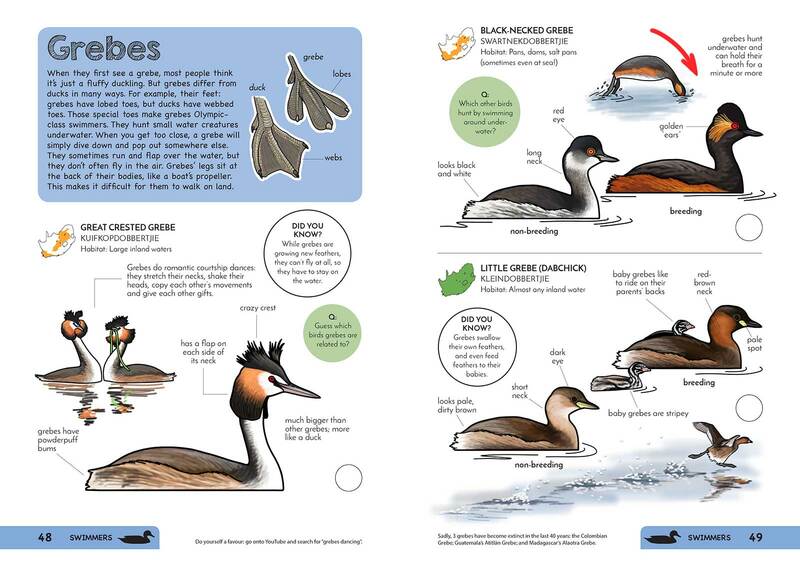 Covers 722 species in total. 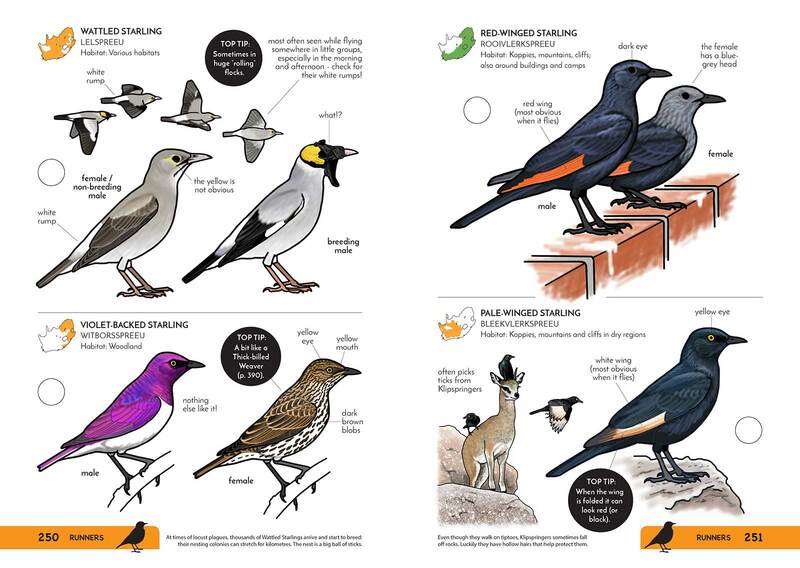 Every bird in SA, not just a few common or obvious ones. 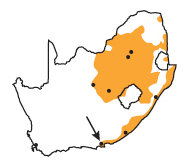 But no super rare vagrants or species that occur only outside South Africa’s borders. 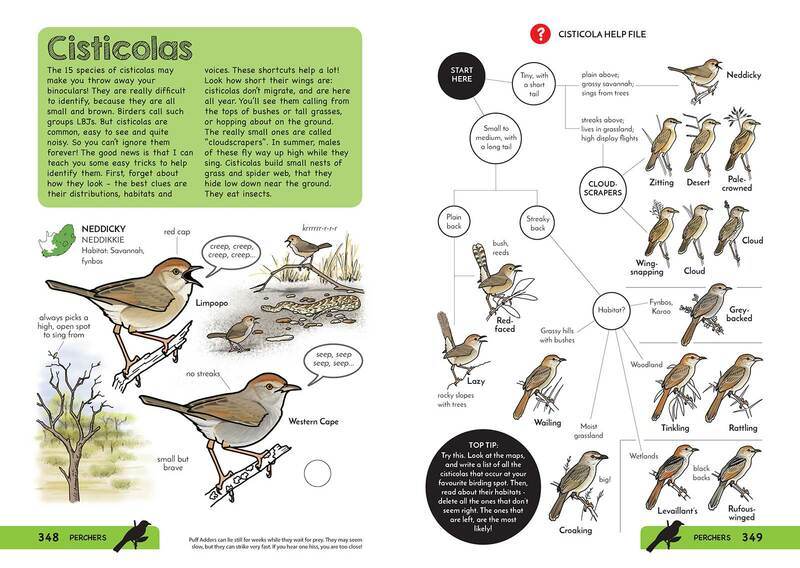 Short and fun family introductions, but no long and boring texts for all the species. Birds are divided into 12 logical groups, like Swimmers, Flyers, Runners and Perchers. Easy! Tick the bird right there on the plate! Each counts a different number of points in the Bird Nerd Game. 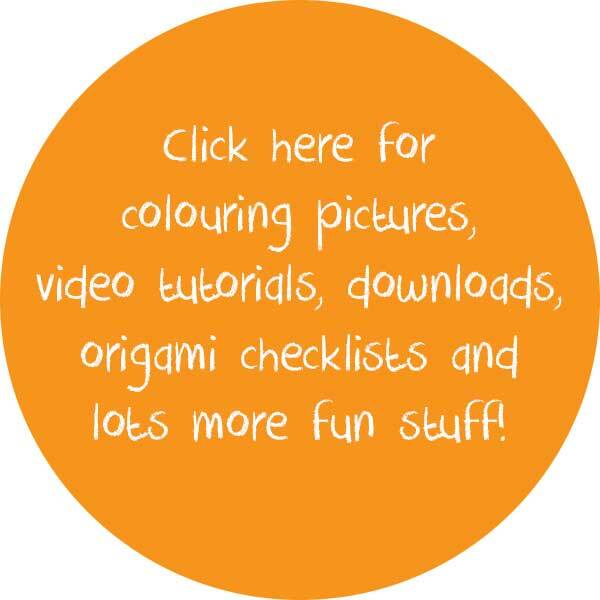 Loads of useful “Top Tips” and fascinating “did-you-know” boxes, plus ridiculous “micro-facts”. Questions and challenges to make it interactive (the answers are in the back). I hope you like my paintings. They are big and a bit cartoony, but still super accurate. In each family, all the birds sit in the same position, which makes comparing the different species much easier. 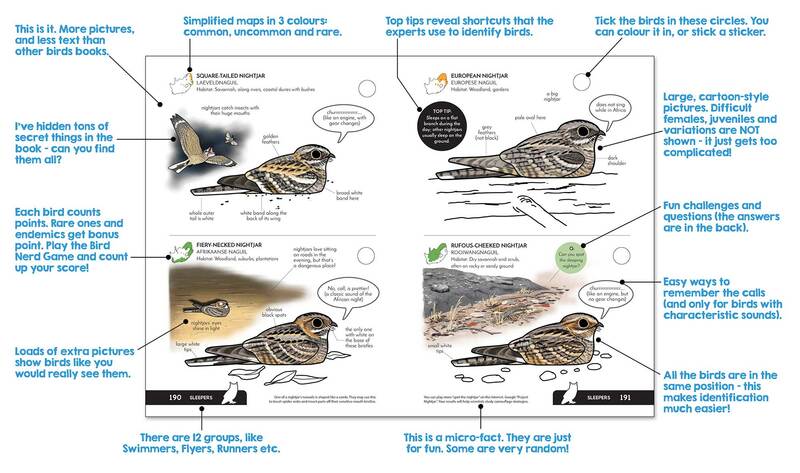 Illustrations are much better for identification than photos. Plus, I drew lots of fun stuff in between the main pictures – such as the little images that I call “thumbnails”. These show the bird like you would really see it in nature, or while it is doing something: feeding, flying, fighting, sleeping, bathing…whatever. What’s my favourite painting? Difficult question. I really like the swift drinking from a swimming pool. 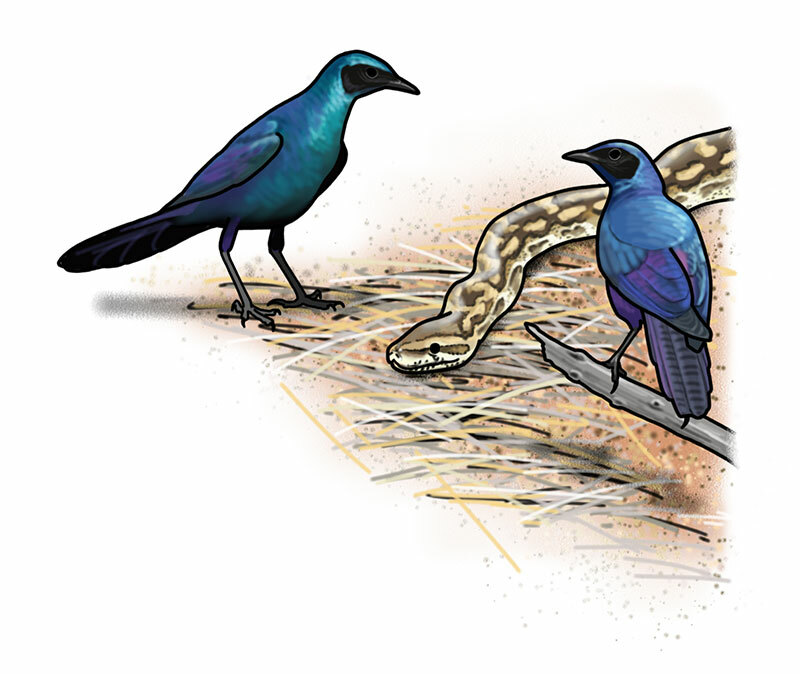 Or the Martial Eagle with an Impala that it caught, or the Grey-headed Bushshrike in a battle with a Vine Snake. Which one do you like most? This book is supposed to be fun! Tell your mom I said you’re allowed to write in it. The dirtier and more full of scribbles, the better! Tick the bird’s you’ve seen in the circles. 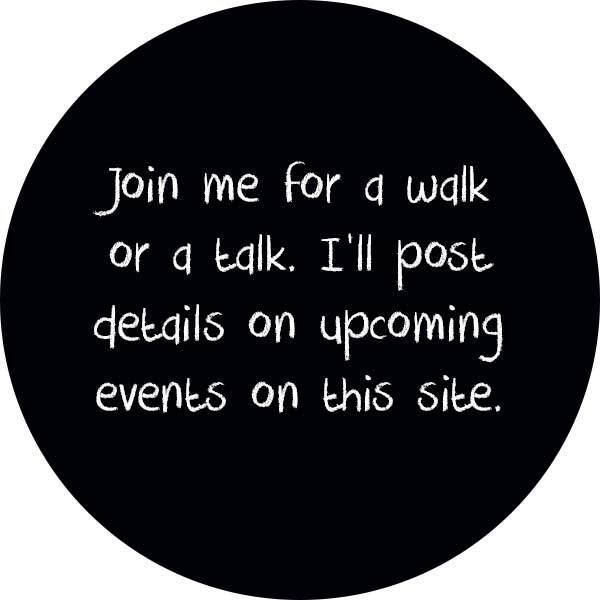 You can make a tick, colour in the circle, stick a sticker, write the place and date, or whatever you like! This is a really fun way to keep track of your sightings. 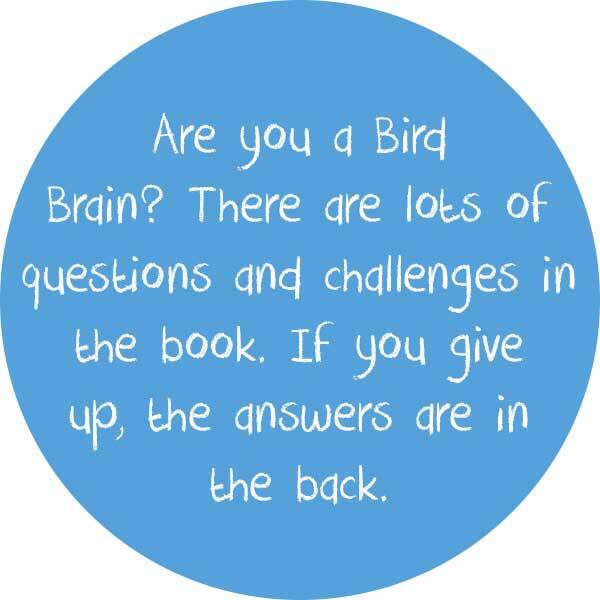 Each bird in the book counts points. The rarer the bird, the more points it counts. 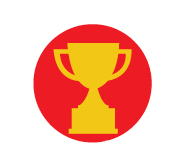 And remember that some have bonus points or double points (see the symbols below). 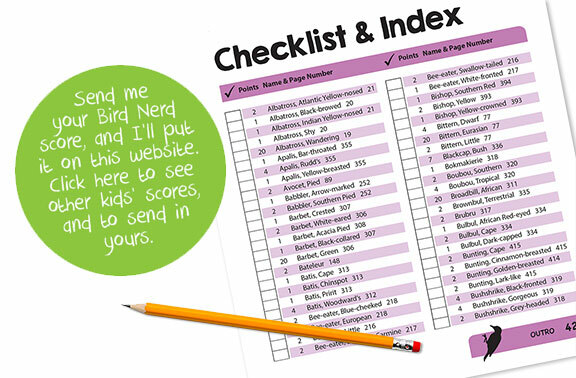 In the back of the book you’ll find a purple checklist, where it shows each bird’s points. 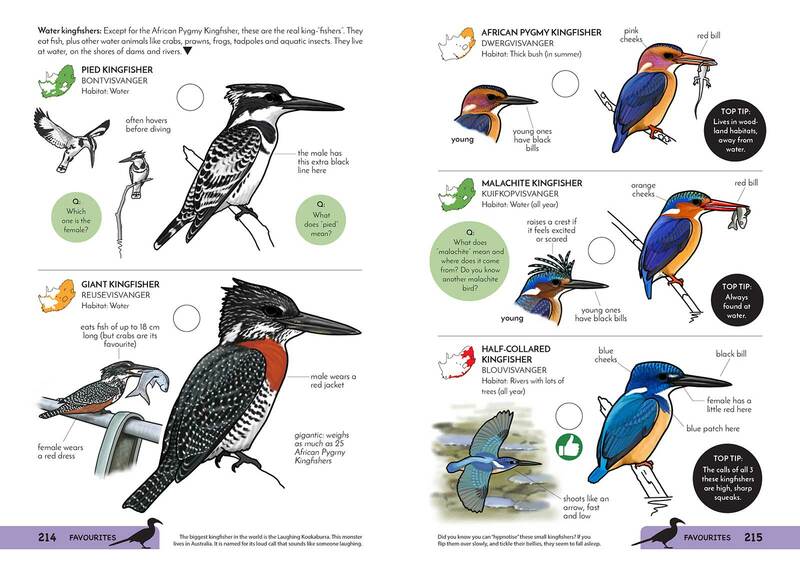 Mark all the birds you’ve seen and count up your Bird Nerd score! And why not send your score to me? I’ll put it up on this website. Also send me your name, age, favourite bird and the bird you would most like to see one day. If you’re lazy to count up the checklist in the book, download this excel file and the computer will count it up automatically. 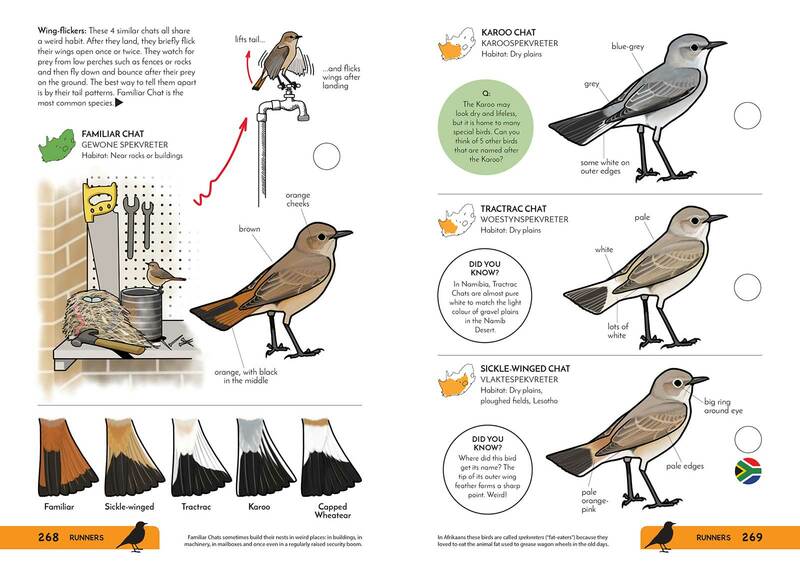 Check out the Bird Nerd page here. My Bird Nerd Score is 1,850. What’s yours? The maps are clean and simple. 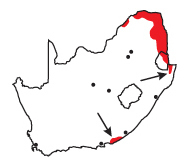 No multiple colours and shades to show abundance or migrations, no vagrant crosses, no subspecies. Simply – does it occur here or not? 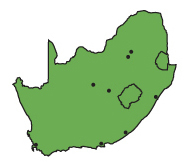 The maps come in three colours that will immediately tell you if the species is common, uncommon or rare. The colours work like a traffic light: green, orange, red. This is linked to points in the Bird Nerd Game. The rarer the bird, the more points it counts. Green is for common birds. Orange is for uncommon birds. Red is for rare birds. Three symbols are linked to the Bird Nerd Game. 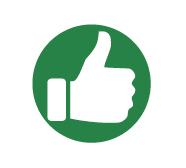 The thumbs-up is for really special birds for which you deserve a bonus point. 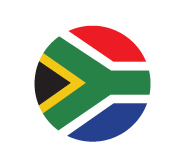 The South African flag is for endemics – those species that live on in South Africa, like sugarbirds. 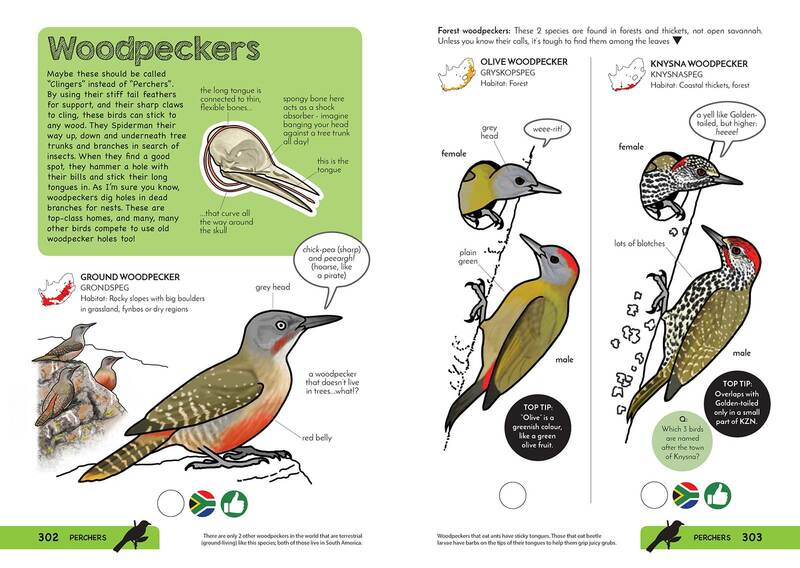 We are really proud of our Mzanzi birds, so you get double points in the Bird Nerd Game if you see one of them. And then lastly, the top 20 megaticks. These count 20 points each! 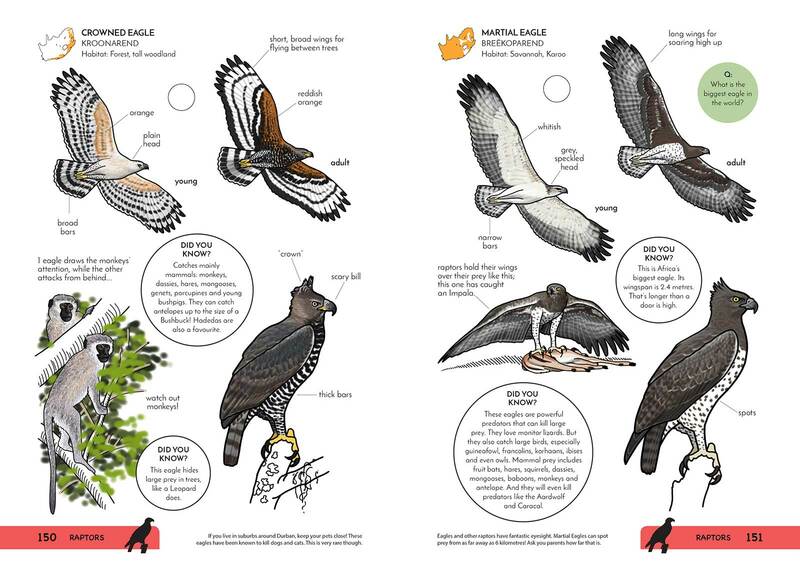 They are really rare, impressive birds – like Saddle-billed Stork, Pel’s Fishing Owl, Narina Trogon and African Broadbill. Let’s go birding! 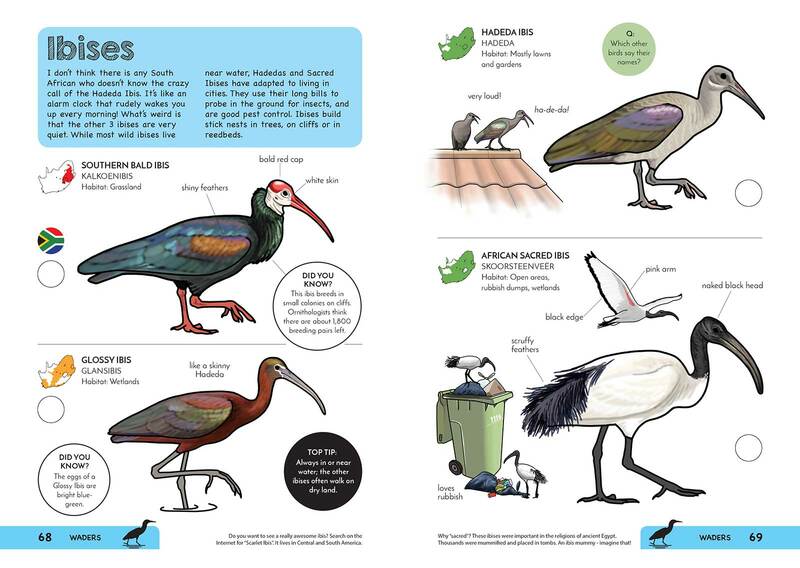 Endemic birds live only in SA. 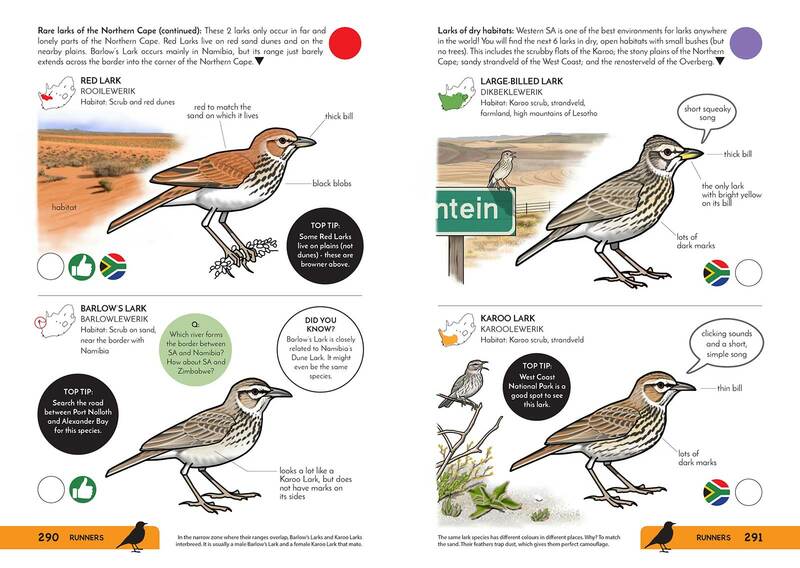 There are 20 trophy birds – the top ticks in SA! You can check out some pages from the book below. Click on the image for a bigger version, and press ESC when you’re done. The book has 432 pages and is A5-sized. 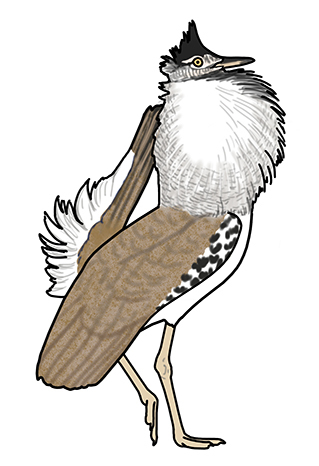 ABOVE: You can identify a Peacock by its heron-like posture, Spectacled Weaver-like face pattern and eagle-like nose. Plus the trusty pair of Zeiss binoculars always hanging around his neck. Faansie Peacock* started birding when he was five, and has been trying to quit for about thirty years. It doesn’t look like that’s gonna happen, so now he makes a living as a professional birder. 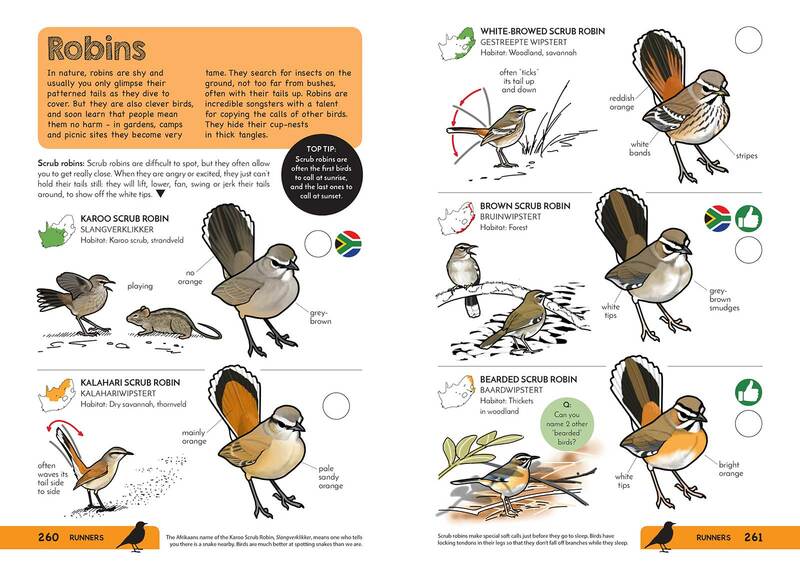 He has written and illustrated a bunch of books about birds: Pipits of Southern Africa (2006), The Chamberlain Guide to Birding Gauteng (2008), Chamberlain’s LBJs (2012) and Chamberlain’s Waders (2014). He acted as the scientific consultant for Newman’s Birds of Southern Africa (2010) and editor for the Eskom Red Data Book of Birds of South Africa, Lesotho and Swaziland (2015). 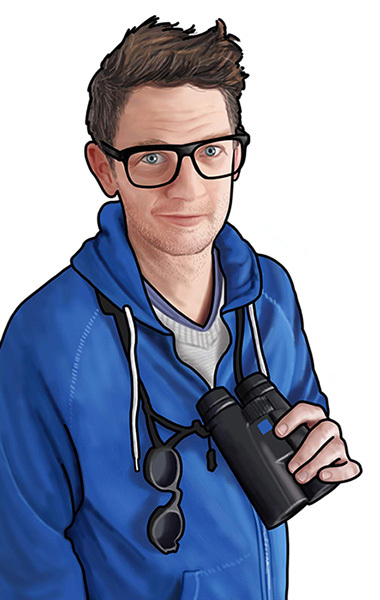 He has also written loads of scientific papers, blog posts (read them all here) and magazine articles – you can catch his articles in every month’s WEG/GO Magazine. He loves telling stories about birds, and has spoken to thousands of people about more than thirty birdy topics. Faansie previously worked as the Curator of Birds at the Ditsong National Museum of Natural History (formerly Transvaal Museum). Here he was responsible for looking after a collection of about 60 000 bird specimens. One of his day-to-day activities included dissecting and stuffing birds – some of the more interesting species were Taita Falcon, Sooty Tern, River Warbler and European Honey Buzzard. He was also responsible for presenting behind-the-scenes tours, databasing, art exhibitions, Night at the Museum events, genetic sampling, research and, sometimes field work (even if only to capture pigeons that flew into the building). 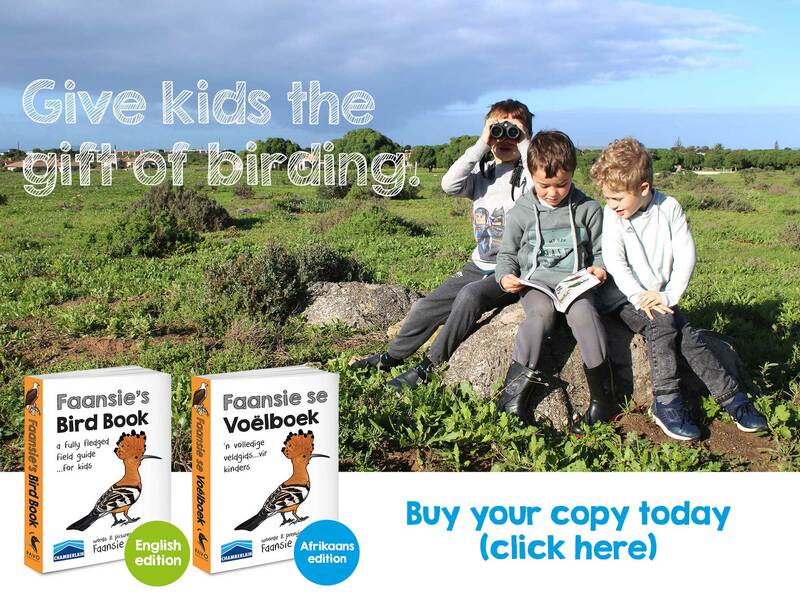 Faansie has birded in Madagascar, Spain, Thailand, Australia, Israel and lots of other places across the world, but his favourite birding spot is West Coast National Park – in fact, he lives within walking distance of this park, in the town of Langebaan. He says it’s really difficult to get any work done when there is always something in the garden that distracts him: rain frogs, snakes, tortoises, antelope, a fox, and, of course, plenty of awesome birds! 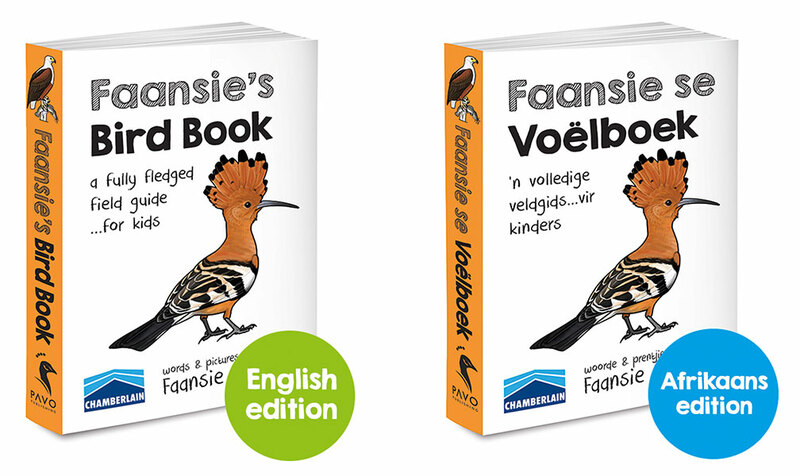 Faansie met his wife Ronél when they were kids – for their first date in high school, he took her to see a Red-chested Flufftail. On their wedding day, she showed him a Dusky Lark outside the church. Two young males recently joined the Peacockidae familie. Choosing names for their sons was a challenge for Faansie and Ronel. Because their surname is already that of a bird, they didn’t want to overburden the kids with obvious bird names. 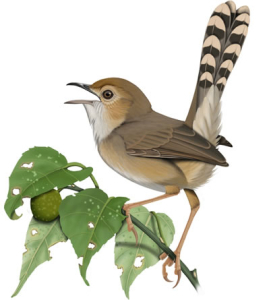 Eventually they chose Regulus – the scientific name of tiny little songbirds called firecrests – as a second name for their son Christian; the name means “Little King”. His younger brother Owen’s second name is Callum – the humble but inspirational dove (see blog post: Owen Callum Peacock). *yes, that is his real name.